Once again, a mass shooting is a focus of public attention after a gunman killed 12 people on Monday at the Washington D.C. Navy Yard where the Naval Sea Systems Command Headquarters is based. The shooter, identified as Aaron Alexis, was killed in a firefight with police. As with such incidents at a school in Newton, Conn. last year, and earlier ones in Aurora, Colo., Tucson, Ariz. and Virginia Tech, the outbreak of firearm violence was the focus of intensive news coverage. While there have been a string of mass shootings over the past two years that have grabbed the public’s attention, they represent a relatively small share of firearm homicides. In the period from 1983 to 2012, there were 78 public mass shootings in the U.S. resulting in 547 deaths and injuring 476 people, according to a Congressional Research Service report. The report defined “public mass shootings” as those that happen in public places, claim at least four victims and have a “somewhat indiscriminate” choice of victims. 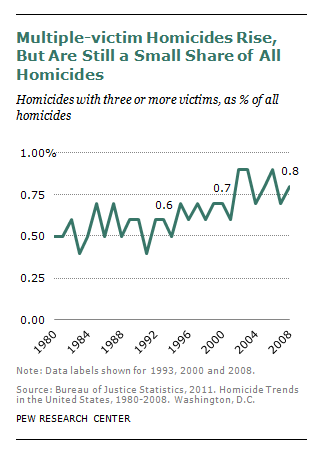 In all, less than 1% of homicides each year claim three or more victims. In 2010, there were 31,672 deaths in the U.S. from firearm injuries, with the biggest categories being suicide (19,392) and homicide (11,078), according to a Pew Research Center analysis of government data. Public opinion has shifted over time about whether mass shootings reflect broader societal problems or are isolated acts of troubled individuals. After the Dec. 2012 shootings at Sandy Hook Elementary School in Newtown that killed 20 first graders and six adults, 47% said the gun violence reflected broad societal problems while 44% saw them as isolated acts, according to a survey conducted that month. 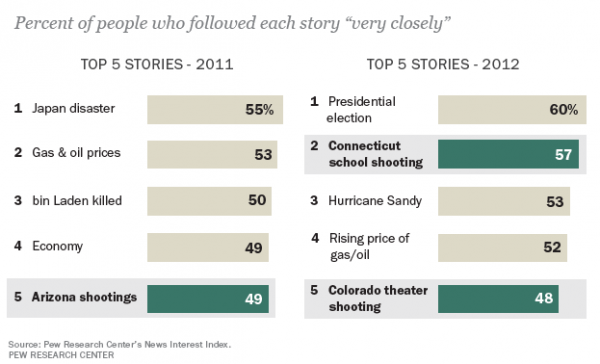 That was a big change from the July 2012 shootings at a Colorado movie theater after which 67% saw the incident as an act of a troubled individual compared to 24% who believed it reflected broader problems. 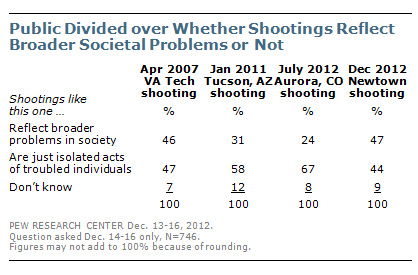 After the Jan. 2011 shootings in Tucson, in which former Rep. Gabrielle Giffords was wounded, 58% saw the incident as an isolated individual act and 31% as a broader societal problem. In the Navy Yard shooting, the gunman was a 34-year old former Navy reservist who officials said had exhibited “a pattern of misbehavior” during his time in the service and later had problems with the law involving the use of guns. He had access to the military facility because he worked for a naval contractor. The gunman in the Newtown massacre was a 20 year-old, Adam Lanza, who killed his mother before carrying out his shootings at the elementary school and then turned his gun on himself. The suspect on trial in the Colorado shootings, which claimed 12 lives, is James E. Holmes, 25, who has entered an insanity plea in his case. The Tucson shootings were carried out by Jared Lee Loughner, 24, who, after being judged competent to stand trial, was later sentenced to seven consecutive terms of life in prison for killing 6 people.